Hitting the road this weekend? Make your Memorial Day road trip even smoother with ShowFolio for iPad mini and mini with Retina display. Fold-away clips let you attach and detach ShowFolio to the back of most car headrest posts with ease for smooth sailing. 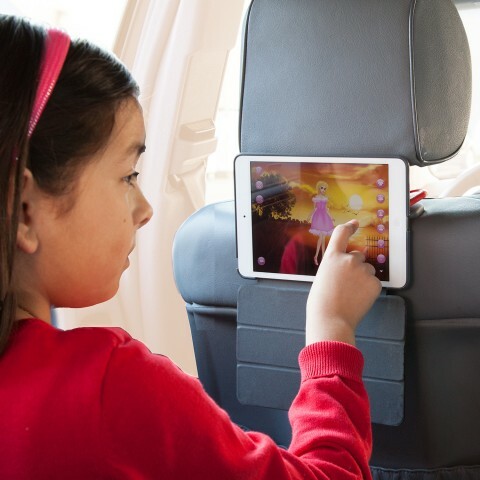 Plus, clips snap neatly into place so you can take your iPad on the go. Thanks to CNN, we’ve got a couple ideas of how to make your trip even more fun with their “Best New Apps for Travelers.” Need something to knock you out after busy days and time changes? Try SleepSounds HQ. Want a better way to organize all of your travel docs like boarding passes, notes, and more? Check out Worldmate. Looking for deals in an unfamiliar city? The Entertainer‘s got the hook ups. Good thing you can use these anywhere- not just on the road. Since ShowFolio has multiple viewing and typing angles, you’ve got the perfect pairing of a fully functioning folio so you don’t have to think twice when switching from home to car to office and beyond!